Have you seen the movie Barney’s Version (starring Paul Giamatti, Dustin Hoffman, Minnie Driver, Rachel Lefevre and the beautiful Rosamund Pike)? Â If so, were you baffled that an entire trio of lovely and accomplished women managed to fall for Barney, a tubby slob?Â I wasn’t. Â That’s because I’ve read the book, which the rather well-intentioned and well-acted movie transformed into a bit of a mess. 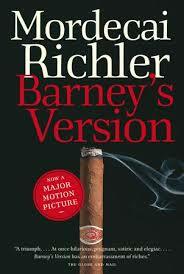 Â Mordechai Richler’s book is one of the finest Canadian novels ever produced, and his Barney is a huge character: Â brash, full of bile and bitter humour, a man who is passionate about business but is also capable of falling “truly, seriously,Â irretrievably in love in love” and “pulling surprises out of a hat”. Â Barney may be a loutish, bigoted cigar-smoking quasi-alcoholic, but he is also Â the loudest, funniest most charming man in the room, a man who seduces women and fundraisers alike. They shouldn’t have cast Paul Giamatti. Â They should have cast Dustin Hoffman about thirty years ago. Â I’m not the first person to remark that Dustin, who plays Barney’s incorrigible father Izzy, looked like he was absolutely itching to play Barney, and I can hardly blame him. As for the ending, it literally sent chills down my spine. Â I won’t reveal more. Â I don’t want to spoil the book for you when you inevitably read it.